See Jane. 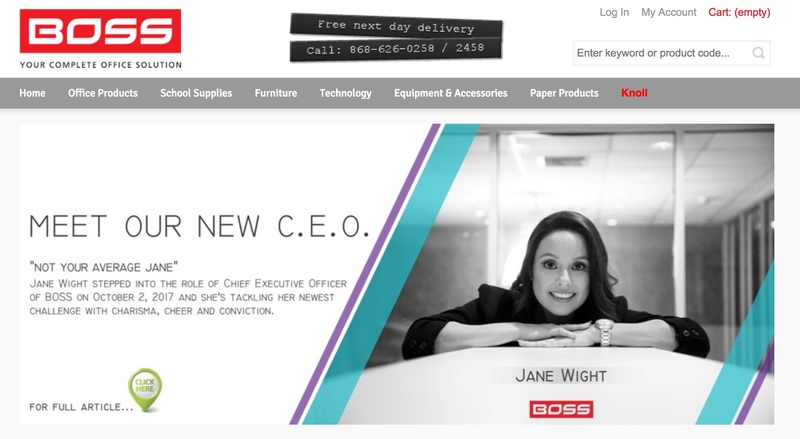 See Jane Run a Company. How did a fascination with football and ladybugs translate into the kind of grit needed to become a CEO? Jane Wight knows. And BOSS, Trinidad and Tobago’s leading office solutions firm, which she now leads, knew that in her, they had found something special. Now, they needed everyone else to know it too — so they called us. We met with Jane. Taking a cue from her enthusiasm, boundless energy and insatiable curiosity, we recommended a three-pronged communications approach to letting customers, suppliers, staff and the wider business community know that there was a new CEO on the block. Sure, we did the whole standard press release thing, but we jazzed it up with interesting info and modern photography that honoured Jane’s personality and the culture of the company. Then, we turned to social media, which — let’s face it — can really skim the surface sometimes. We wanted people to really connect with Jane because she’s good at what she does and she’s really down to earth about it. So we wrote a story. People love stories, right? And we made sure it was supported by lots of relevant pictures from an up-and-coming photographer. The combination was funny, relatable and inspirational, so people started liking the content. And sharing it. Which was pretty much the point. But wait — we didn’t tell you what the third prong of that three-pronged communications approach was, did we? Hm. Stay tuned. Copyright © 2016 The New Cheeze.